Sgt. (Ret.) 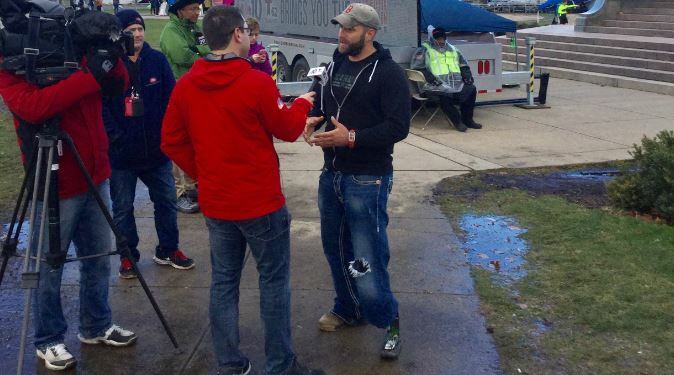 Earl Granville, wounded in Afghanistan, gives a post-Marathon interview to NBC10, as Fox29 waits in the wings. It’s the age-old question: If a tree falls in the forest and no one is there to hear it, does it make a sound? There are many ways to argue it of course. At its most basic, sound is vibrations in the air and whether or not there are ears there to hear it is irrelevant. But this blog is not about arguing the merits of old philosophical dilemmas. Rather, it’s about bringing attention to your organization’s events. And some might argue that if you have an event and no one is there to witness it, it really wasn’t an event at all. But how do you go about getting the media to your events? It is incumbent upon you to get inside the mind of the viewer and the journalist and think about what’s newsworthy. We know the more salacious the better, and if anything bad or controversial occurs rest assured they’ll be out in force, possibly with helicopters. But if we’re being honest we also know that the media generally seek balance and will engage with a story that is interesting or has “feel good” value. These qualities, along with community outreach initiatives and technological breakthroughs can elevate the reputation of your hospital, health system or facility, and draw in journalists, so start by focusing your efforts there. A recent SPRYTE example illustrates this approach. Responsible for the promotion of the 2017 American Association for Cancer Research (AACR) Philadelphia Marathon, SPRYTE employed two of our tried and true tactics, the media advisory and the story pitch, to gain a tremendous amount of media coverage over five months, culminating with the AACR Philadelphia Marathon Weekend Nov. 18-19. Media advisories were used for pep rallies and announcements, and pitches employed for feature stories. These included the story of U.S. Army Sgt. (Retired) Earl Granville, an Afghanistan vet and wounded warrior who ran the Dietz & Watson Half Marathon Nov. 18 on a prosthetic leg. It was a powerful story that begged for media coverage…and received it, from NBC10, CBS3 and Fox29. Breandan Lyman also got media loving for his two unlikely paired hobbies: distance running and competitive eating. The frequent Philadelphia “Wing Bowl” competitor was featured in Philadelphia Metro the week leading up to the Marathon. These are just two of the many powerful and quirky stories that have value. You can view these and other Marathon earned media results at this link. Alas, it is possible to work everything just right and still miss out on media engagement. For instance, your charitable fundraiser can easily get bumped by another story such as a house fire or local scandal. That’s the nature of the beast. You can’t count on the coverage until you see it on air or in print. As we alluded to above, it’s easy to think of the media as that ogre that shows up to call attention to something bad, but this thinking is limiting and not altogether true. The fact is, media want newsworthy content. Giving them what they crave helps them as well as you. Once your story gets covered, it is free and, via social media, possibly viral publicity, ready to be merchandised and shared through your own social channels and other communications tool, as discussed in last week’s Insights blog.